In the cities of New Spain, Miguel Cabrera (1695?-1768) painted some of the most desired and famous works of art in the 18th century. 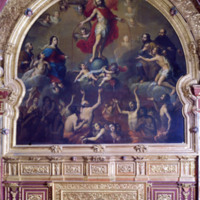 This painting was created for the Jesuit church at Tepotzotlán, Mexico. Viewers of the large painting find themselves at the eye level of the anguished souls in the chaos of Purgatory. Above, the composition becomes harmonious around the figure of Jesus Christ. Christ’s figure, spouting blood from its wounds, is an allegory of him as the fountain of salvation. On the left, the Virgin Mary offers protection to a soul as he makes his way from Purgatory to Heaven. Saint Peter, the founder of the Catholic Church, is behind her. At the bottom of the image, the inhabitants of Purgatory are male and female, light- and dark-skinned alike. Purgatory was not portrayed as a place of fire and anguish. Nonetheless, the souls caught in it look upward to their ultimate goal: heaven. As one of the most sought-after painters in New Spain, Miguel Cabrera’s output was prodigious, the result of a well-staffed workshop where apprentices would do everything from preparing the canvas to painting, save for final touches added by the master. Thus, the paintings attributed to (and sometimes signed by) Cabrera are notoriously uneven. But at his finest, Cabrera’s brushwork and sense of color are stunningly beautiful. The painting is oil on canvas, and was designed for the space in which it is currently set. It is surrounded by an impressive gilded frame. One skill that appealed immensely to his patrons was Cabrera’s mastery of the baroque “environment”: cycles of paintings, integrated with retables (retablos) and frames for 18th-century churches. 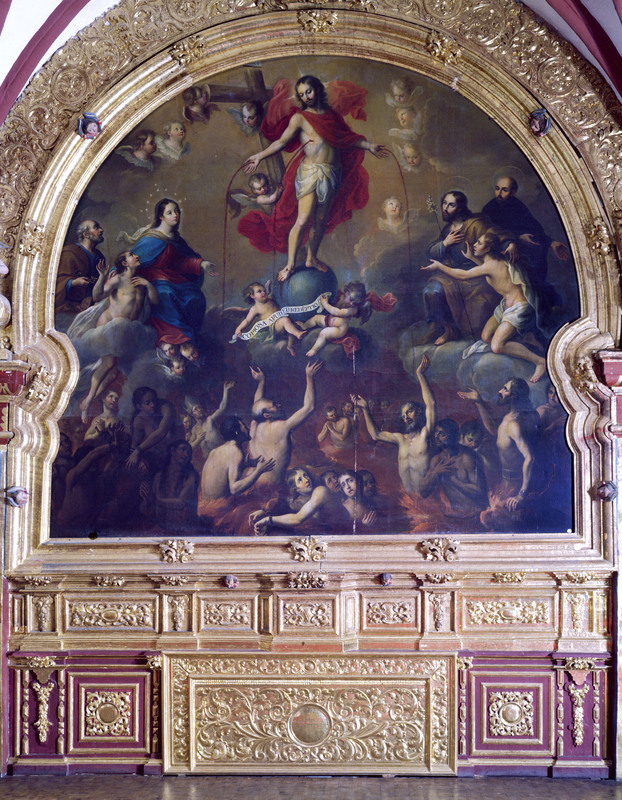 A sense of this can still be gleaned in the church of San Francisco Javier, the Jesuit monastery in Tepotzótlan, where this painting is found. Almost all the original decorative cycle, much of which was created by Cabrera and the sculptor Higinio de Chávez, remains intact. Some scholars have argued that Cabrera, who was the adoptive son of a Spaniard from Oaxaca, was mestizo, and this idea, if true, sets him apart from most of the other renowned painters of his generation, who were Creoles. Being a mestizo would have excluded him from guild membership and curtailed his ability to run a workshop and compete for prestigious commissions, yet Cabrera’s career seems to have suffered no such limitations. No matter what his birthright, Cabrera displayed the conventional Creole prejudices of his day. When he and other leading Mexico City painters attempted to found an art academy in 1753, they decreed that only artists of Spanish descent were welcome as students, and those of “color quebrado” (dark skin) were barred. Museo Nacional del Virreinato, Tepotzotlán. Do not duplicate. Used by permission of the Instituto Nacional de Antropología e Historia, Mexico; all rights reserved. Carrillo y Gariel, Abelardo. 1966. El pintor Miguel Cabrera. Mexico City: INAH. Martí Cotarela, Monica and Dolores Dahlhaus. 1999. Miguel Cabrera: Un pintor de su tiempo. Mexico: Circulo de Arte. Toussaint, Manuel. 1967. Colonial Art in Mexico. Elizabeth W. Wilder, ed. and tr. Austin, Texas: University of Texas Press. Tovar de Teresa, Guillermo. 1995. Miguel Cabrera: Pintor de cámara de la reina celestial. Mexico City: InverMéxico.